Recently I have been working on a project that will soon be revealed with before and after photos. I am just working on some last minute details :). Anyway, we had a custom wall unit built into a family room to accommodate an 80″ TV. That is what has inspired this weeks posting. I found several different types of wall/media units. Its great how you can incorporate so many different materials into a simple idea as a wall unit. This is my favorite room/ media unit that I researched. It looks like this space is located in a basement. Even if you do not have a ton of space, knowing how to use the space given is extremely important. Here it looks like they might have covered a structural column, something that couldn’t be removed so why not work with it in the design. The sleek natural birch wood paneling compliments the rustic exposed ceiling. Some shelving underneath the TV allows you to de clutter and organize books or game consoles. The use of color is also very comfortable and inviting. This custom media wall the designer paired natural stone along with natural wooden shelves and cabinetry. The shelves being offset and almost floating help obtain a balance visually. They also imitate the look of box beams simply by finishing the shelves with a smooth finish rather than textured and painting the same color as the wood finish. Bringing the outside indoors can be very appealing and help you accomplish your rustic contemporary look. For a very different look, this designer went with an all white achromatic color scheme. Keeping the cabinetry at the bottom and shelving along the sides and top of the tv looks very organized. Great storage space for the book lover, and appealing to the eye decoratively. The coffered ceilings, trim and pot lights are great accents to this space. To finalize the rug is pulling all the different colors from the books in the wall unit, wooden chairs at the table create a great ambiance. This is a great room, the taupe/greyish tone of the wall unit is unique and modern. A different take on your routine white or natural wood finish media units. I like how they have kept the decorative pieces simple with white and black pieces. The top of the media unit is decorated with an asymmetrical style as you work down it may not be exact but visually it balances out. This media unit is very characteristic, from the crown molding and trim work to the painted backings of the shelves. Every room needs a focal point and this room has captured that with this unit. 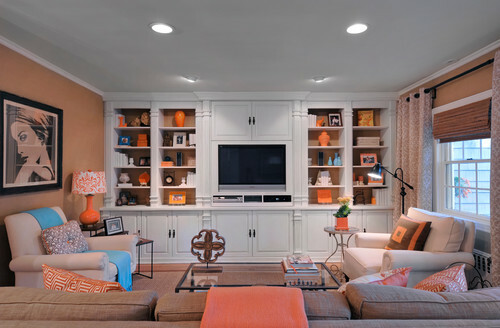 A great use of color in this space, the tangerine splashes, tan walls and textured blinds. A touch of aqua blue bring a sense of freshness to this room. 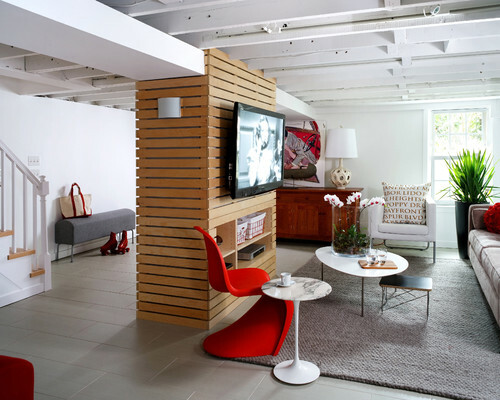 Modern Basement by Chevy Chase Architects & DesignersWentworth, Inc. Overall the concept of this blog posting was to go over different types of Wall units/ Media Centers. As you can see there are tons of options and ideas when it comes to this. If you are interested in building a custom wall unit in your current home please feel free to contact me and I can have something sketched up for you. I would be happy to sit down with you and discuss options. It is a great way to de clutter a room and create a main focal point.